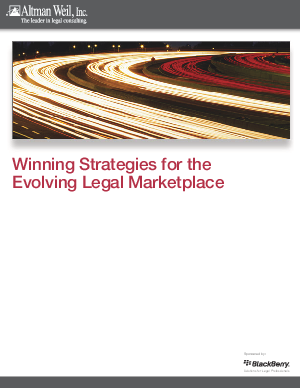 In recent years, law firms have enjoyed remarkable financial returns due to a strong global economy, free flowing capital and a high level of demand for legal services. Law firm revenues and profits continued to be strong, even during the dotcom bust, the post 9/11 slowdown and the increasing cost of associate recruitment and retention. This success could be partly explained by the growth imperative in law firms: they must continue to grow, either by acquisition, or by recruiting laterals or associates, because law firm economics correlates size with profits. And many firms grew rapidly in the past several years. Although law firms seem to be insulated from economic shock waves, their growth and success depend upon generating profits from revenue while corporate counsel are under continuing pressure to contain legal costs. When the world's economy recently ground to a virtual standstill and capital dried up, law firm clients delayed projects and transactions, cut costs and slowed down their payments to vendors, including law firms.